"Wisdom doesn't just come with age; it also comes with experience. 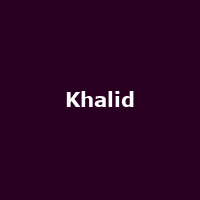 By 18-years-old, Khalid's experience encompassed living on two continents with his Army mother and stepdad, classical vocal training, the creation of a viral smash "Location," and inking a major label deal with RCA/Right Hand Music Group. Shortly after his high school graduation, Location swept up over 1.52 million plays in less than two months, received Snapchat plugs from Kylie Jenner and Rita Ora, and landed the budding singer and songwriter on Pigeons & Planes, Earmilk and more. His journey serves as the foundation for the songs." My music comes from growing up in the military, traveling a lot, learning how to start over, and being comfortable with new places. He released debut album, "American Teen" in 2017 and was listed in the BBC's Sound of 2018 poll, finishing in 4th place. The follow-up album, "Free Spirit" was released in 2019.